The issue of the documentation was raised by MEP Luke Ming Flanagan in May, after he was not allowed make notes at a reading room set up in Brussels. TDS HAVE BEEN given access to documents relating to the Transatlantic Trade and Investment Partnership (TTIP) negotiations, but aren’t allowed make notes. This week, independent TD Tommy Broughan said he had visited a similar reading room at the Department of Jobs, Enterprise and Innovation. Supervised access to the TTIP documents was made available to Deputies and Broughan took the opportunity to access them even though allocated slots were for a short amount of time. However, Broughan said deputies were not allowed take photos of, or transcribe, information from the documents. TTIP is an agreement that would reduce tariffs and standardise regulations around food safety, pharmaceuticals, energy, textiles and other industries to streamline business between the world’s two largest economies. 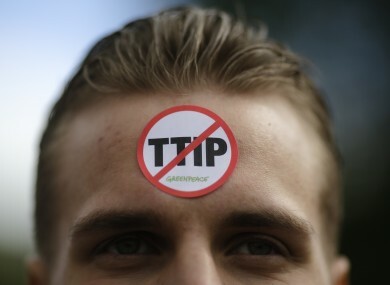 One of the stated aims of TTIP is to standardise these sort of regulations to open up markets to more products. However, critics say the deal is too favourable to corporations and multinationals as well as a provision that would give corporations the power to sue governments for lost profits over unfavourable laws, as exemplified when tobacco giant Philip Morris brought a claim against Australia after the country brought in plain cigarette packaging. The Department of Jobs, Enterprise and Innovation says that notes are prohibited because of American reservations. All EU negotiating texts made available on the Commission’s website. Unlike the EU, the US does not publish its negotiating texts. The US has separate protocols for reading its documents and the EU follows these protocols in relation to the US texts. “This is why special reading rooms have been created in capitals around Europe to allow parliamentarians to review the consolidated EU-US versions of the negotiating texts. This is the same procedure that the US has for Congress. Email “TTIP is a major trade deal for the EU - but TDs aren't allowed take copies of its documents”. Feedback on “TTIP is a major trade deal for the EU - but TDs aren't allowed take copies of its documents”.